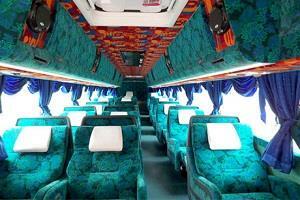 Supernice Grassland, also known as Comfort Super Nice Express Sdn Bhd, was established in year 1980’s by the Managing Director Mr.Chew Suu Khoon with only one single unit of 40-passenger express bus. 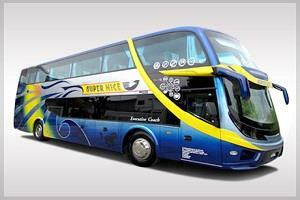 Today, Supernice Grassland is one of the leading bus operators with headquarter in Butterworth, Penang. Supernice Grassland is also one of the Malaysia’s largest, fastest growing, and most popular long-distance bus transportation company. Supernice Grassland offers bus services to many top destinations within Peninsular Malaysia including Ipoh, Kuala Lumpur, Klang, Seremban, Melaka, Muar, Batu Pahat, Johor Bahru, Genting Highlands, Kuantan, Butterworth, Penang, Alor Setar, Sungai Petani and many more. The popular bus routes by Supernice Grassland include bus from Kuala Lumpur to Johor Bahru, Kuala Lumpur to Singapore and many more. Supernice Grassland currently owns more than 30 units of 1st Class 18-Seater and 27-Seater Super VIP air-conditioned express buses. Supernice Grassland always put passengers’ safety and comfort as their top priority. The buses are equipped with charging port, on-board television and WiFi facility. Moreover, Supernice Grassland’s drivers and staffs are very experienced and well-trained. Hence, passengers can rest assured and enjoy the ride until they reach their destinations. With constant upgrades and maintenance of all their buses, Supernice Grassland is able to provide customers with the safest, fastest, and most comfortable long-distance bus service throughout all major cities in Peninsular Malaysia and Singapore. 5005, Jalan New Ferry, 12100 Butterworth, Penang. No.6, Jalan Pantai, 12000 Butterworth, Penang. K-6, Perhentian Bas Ekspress, Jalan Kuala Ketil,08000 Sungai Petani, Kedah.